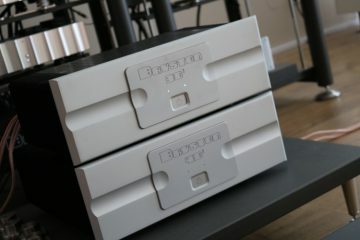 The picture above shows the new Rowland 725 power amps that I had on visit for a review. Read more about it here. 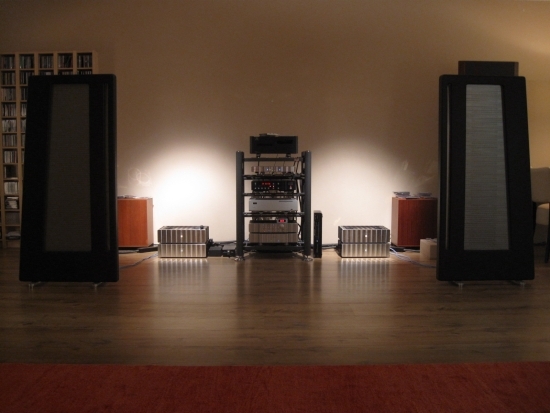 But, as you have by now probably gathered, the Duetta Sigs also work splendidly with the Jeff Rowland model 6 power amps. 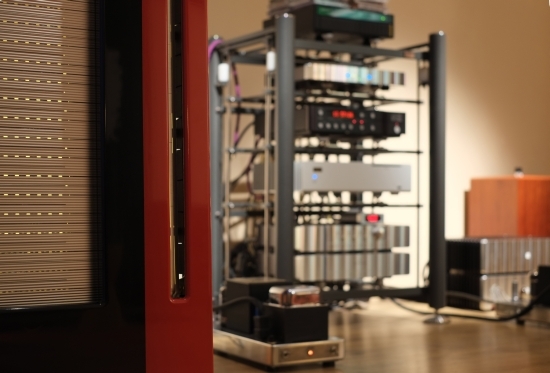 With 16 transistors per monoblock and up to 50 amps of peak power, they have more than enough current to drive the Apogees well. And Rowlands are just what the Apogee-doctor ordered, it seems, because they have absolutely zero grain. 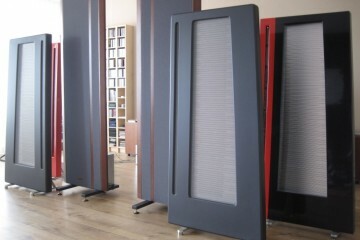 A common misconception is that Apogees must be used with Krell amplification. 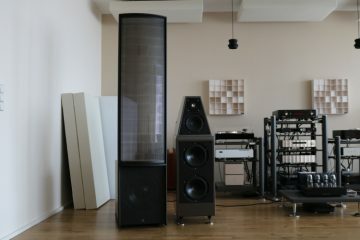 But in my experience using Krells like the KSA250 and KSA400, this will only add more grain and agression to what already are quite explicit sounding speakers while not helping in other areas at all. On the contrary: the Krells I compared my model sixes with had less definition, less transparency and less articulate bass. They did have bass power, but not a whole lot more than the Rowlands. Maybe their bas was thicker, fatter, but not better. Go figure! Naturally I should add that the Duetta Signatures with their purely resistive 3-ohm load aren’t really difficult speakers to drive. But they are quite inefficient so a good current source never hurts. I assumed that the vDH cable wouldn’t be ‘high end” enough, so I cut it off at the receiving end of the crossovers, connected some nice terminals and inserted my usual Transparent Reference XL speaker cables. I was in for a surprise: even though I’ve been advocating system synergy for a long time now, as well as the relativity of it all, still the outcome this time was entirely unexpected! Would you believe that the Transparent dulled down the sound to a level that it just wasn’t enjoyable anymore? Sure, there was a richer texture, smoother treble and a larger, better layered soundstage, but at the expense of speed and dynamics. I know that all Transparent cables need to be used with care, as some equipment can’t cope well, but since the Magnepans work so well with them, I assumed that the Apogees would do even better. Surely there are better cables than the vdH but for the moment the Skyline Hybrid performs so well that well after this review was written, I was not in a hurry to try other cables. 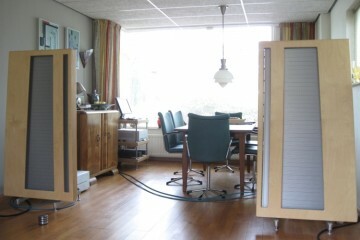 By now I have conducted comparisons with other speaker cables as well as some single wire/bi-wire/ bi-amping experiments. Above: The MRTW ribbon is tilted halfway by means of a foam piece. This improves treble response when standing up and walking around. Lots of friends commented when they were over on how much better the Apogees sounded than my Magnepans. Only one friend (Jan) found that the midrange was simply too rough and hard and preferred my Magnepans. 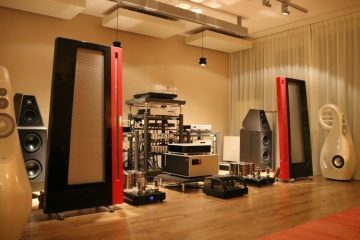 While I can’t deny that this can be the case, they offer a lot in return and mostly they sound fantastic, so at that time I had just settled with their roughness. 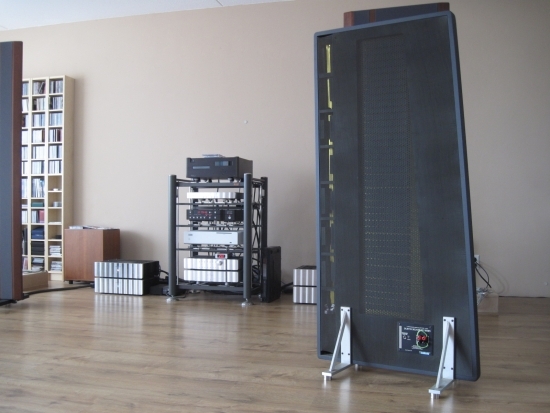 Jan had had original Apogee Duetta Signatures before, three times even, but never had he heard them the way they sounded at my place. 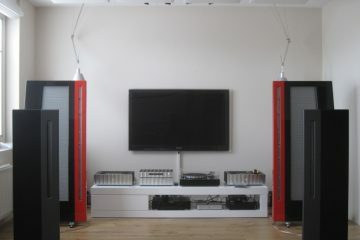 Of course the refurbish is debet to them being so impressive now, but also the amplification plays a very large role. All Apogees are brutally honest and I think it is safe to say that most models can also sound agressive when ill-partnered. Jan had a Krell KSA250 at the time. 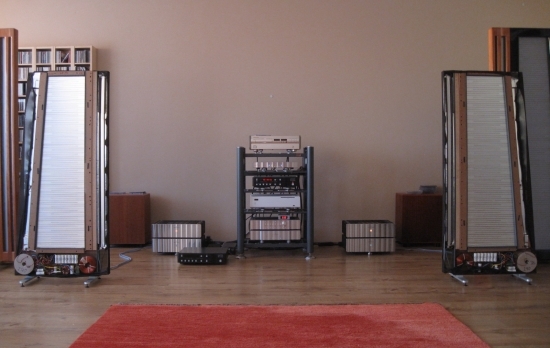 By now I know how the Krell sounds compared to the Rowlands: rough, forward, edgy and lacking finesse and resolution. While the refurbished Duetta Sigs were surely forward and a little hard at times, this wasn’t to the extent of Krell-ness. So, Jan went off to search for a pair of model sixes. Oh, and he proceeded to search for, and buy a pair of Duetta Signatures for the fourth time in a row! Jan’s set of original Duetta Signatures was the first to be compared to the refurbished ones from JW. I would later get my own pair of original Duetta Signatures and further below you’ll find a comparison of all three models. After Jan had aquired a set of original Duetta Signaturs, he offered to drop them off at my place first. This original pair sounded great from the get go, especially if you consider that they’re made in 1991! Inside inspection has revealed that the foam damping is deteriorating but in spite of that, there’s not a rattle or bass buzz anywhere unless you really crank them up way beyond levels that I need. These levels by the way elicit buzz from all Apogees tried, my own Duettas, JW’s refurb’s ones and my current Divas included. The original ones that Jan loaned to me, sound a lot different from JW’s refurbished ones: much smoother, more fluid and more forgiving. They still cope admirably in the bass department, being not too far behind the refurbished ones. But, they’re also a lot more laidback, less well-paced and a lot less dynamic. They’re actually reminiscent to my Magnepans that way, albeit still more dynamic and a lot fuller in the bass. 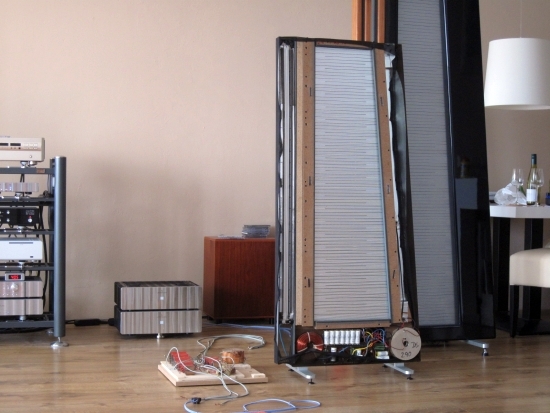 But they also project sound less well, making it stick to the speakers more than with either the refurbished ones or the Magnepans. Speaking of the Maggies: they are actually incredibly spacious, even more so than the refurbished set but I’d still choose this mellowed set of Duettas over the Maggies. Thing is: at this stage we ultimately found them a little disappointing if you heard the refurbished ones first. But we hadn’t started optimising anything just yet. 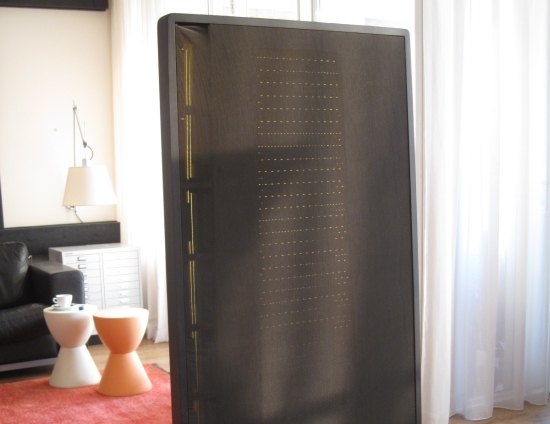 Above: The Original Duetta Signatures have screen material to protect the fragile foils. Especially at night his makes the foils appear darker that those on the refurbished speakers, which don’t have any protection. I had made the comparisons in Jan’s absence but after I told him about the results and he came over to listen for himself, he concluded that they were very nice, but indeed lacking some dynamics and slam. In the meantime, I got the crazies as well because after I had heard his set and knowing that they did not buzz at all, unless playing at orcane-levels, I was now convinced that I could safely buy an original set. I found a set in great shape and Jan himself helped me get them to my home. 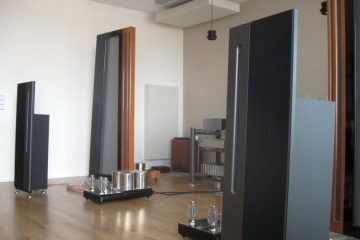 Apart from a light buzz mainly in the right speaker with particular pieces of music. I found two tracks on different CD’s thus far that make the Apogees produce some symathetic buzz on certain low bass frequencies: Eric Truffaz – Bending New Corners (I forget which track), and Paul Brown – White Sand, track 3. However, I quickly found that JW’s refurbished Duetta Sigs behaved exactly the same way, and also it was mainly the right hand speaker. I later found that even my Divas do buzz somewhat but only when pushed even harder. So I must conclude that with Apogees some buzz is apparently unavoidable. The weird thing is that with other bass-heavy cd’s like Maxwell’s Embrya, all Duettas produce ponderous bass without any apparent buzz, so it is particular frequencies that apparently make the foil break up into a resonance. Interestingly, the state of the foam damping doesn’t appear to have a whole lot to do with whether or not the speakers buzz. It’s likely more a matter of wrongly tensioned foil. I do have to note that this buzz is only audible when standing right by the speakers. From the listening position it is not audible and at any rate, the buzzing I noticed is far less obvious than reflex-port chuffing in bass-reflex designs. Perhaps I have yet to experience the rattling talked about on forums but it seems to me that there aren’t actually many problems with Apogee speakers. Back to the audible differences. 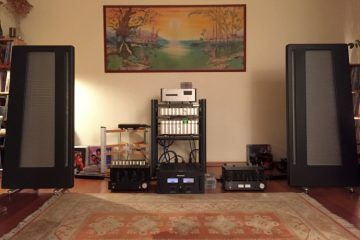 My newly aquired original Duetta Sigs simply sounded fantastic: while not as superbly “live” and dynamic, they were much more forgiving and within minutes of first listening, both Jan and I already knew that they performed way more akin to the refurbished set than to Jan’s own set, but without the downsides. This was enough to make Jan decide not to keep his set. Later, his set would be sold to JW, but that’s for another story. Cross-comparisons in exactly the same spot, with the same cables, revealed that the three sets sound quite different. All have the Apogee character, which is best described as bass-rich yet transparent, dynamic, a little forward in the midrange and a little unforgiving. The best set in terms of dynamics and live-like sound (not necessarily life-like) is JW’s refurbished set. Not far behind is my newly aquired original set and third is Jan’s set. However, as mentioned above, optimisation wasn’t done yet and it turned out that our ranking was about to be shuffled. Just why would my Duettas sound more lively than Jan’s? 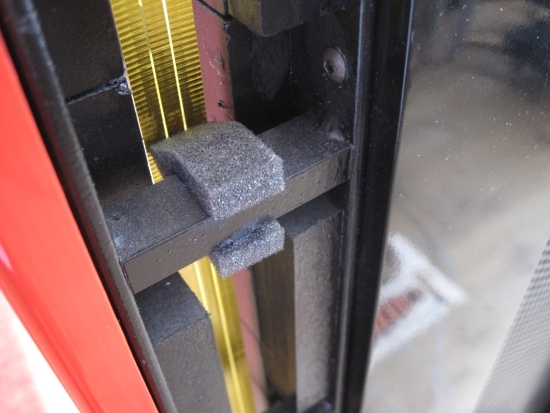 JW has a theory that the magnets differ in strength, a suspicion substantiated by information that Jan found on a forum, about 2 different magnets used for the Diva range. This is all still unconfirmed but all I can say is that no matter what we tried on the cabling and amplifier side, nothing could bring Jan’s set to sound as dynamic as the other two. We also inspected the crossovers internally and they are 100% identical. Above: The refurbished set has all screen removed as well as the sock on the rear, making for a much cleaner look. 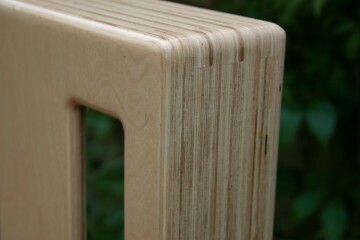 They also have an extra layer of MDF glued to the rear. After more and more listening, we grew more and more tired of JW’s refurbished set. While they could be magnificent on heavy bass tracks and pure vocal/jazz arrangements alike, it was now becoming evident that there was something profoundly wrong with them. Switching back and forth between all 3 sets, more and more I liked my own set, with Jan’s set coming in behind them. JW’s refurbished set was now occupying a parallel ranking besides the others: sometimes outranking the others (dynamics and slam), other times clasing below them (agression, forward midrange, rough/hard edges). At this time I also noticed that biwiring made a large difference, as did the precise type of connector (banana=bad, spade=good). Biwiring is another subject that people can’t seem to agree on. Never mind for now why it sounds different. I will simply describe what I heard in experiments with Jan’s set of original Duatta Sigs. I used the same van den Hul cable that Toine used: Skyline Hybrid. I made double runs, connected to the same connectors at the amp end but first only connected one cable set per speaker, on the tweeter side. 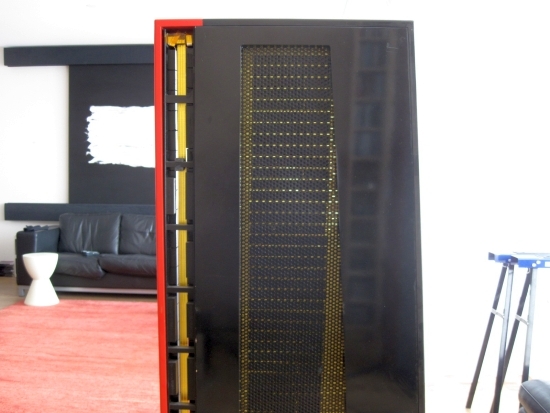 The biwire terminals on the speakers were bridged using short pieces of solid core OCC copper. With this one cable the speakers sound pretty good but a little lean in the midrange and constricted in soundstage size. 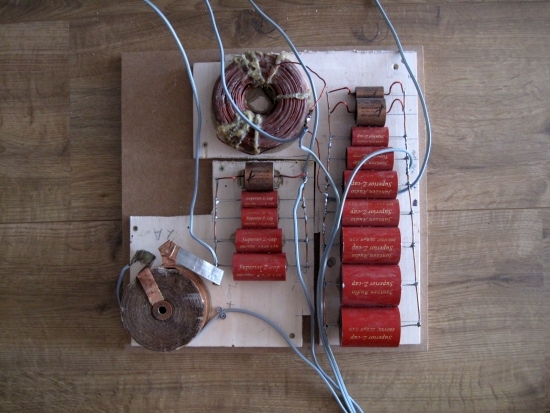 Connecting the second run to the woofer terminals, leaving the jumpers in place effectively doubles the amount of copper but retains the single wiring method. The resultant sound was quite different: a lot fuller in the bass, but also woolier and seemingly slower. Midrange was richer but also a little less transparent. Treble was ok both ways but the soundstaging had not changed. The last step was removing the jumpers. Would you believe that this made a huge difference? Shouldn’t do at a length of only 2,5 meters, I know, but it did: bass became tighter while remaining fulness, midrange opened up and became more transparent and the soundstage opened up too, becoming more room-filling and having better projection. What’s more: with the use of better spades (Rhodium LOK types), adding Cerapucs under the amps and switching them in high gain, high input impedance mode, I managed to further tweak the sound into a direction that benefitted the original sets more and more. Now, comparing all sets, the differences were still there, but now Jan’s previously shy set started to come alive, my set became even better and JW’s set, well, you can imagine that matters only got worse for that set. One thing we still couldn’t be sure of with JW’s Refurbished set, is what exactly the upgraded crossovers contribute to the sound and what the new foils bring. After all, we can only hear the refurbished speakers complete with the upgraded crossovers because the original crossovers have been removed. But Jan agreed to an interesting experiment in which we will connect JW’s new upgraded crossovers to Jan’s speakers. 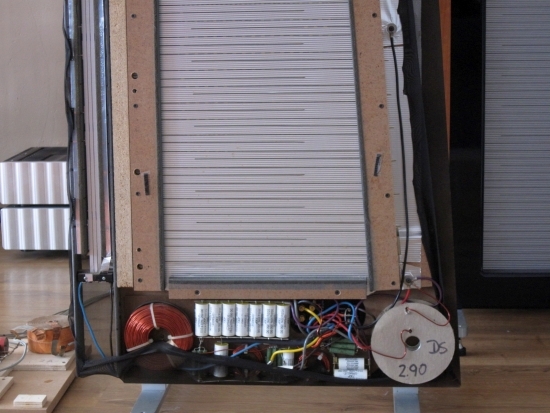 This will show if they lift the speaker’s dynamic performance but also if the extra coarseness that JW’s speakers exhibit is due to the crossover components or to the foils themselves. 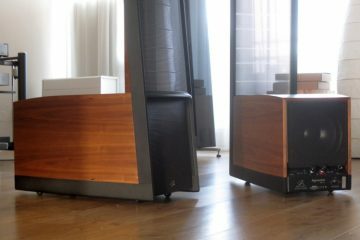 If they make Jan’s speakers also sound coarse then we know that JW’s crossovers should be modified with smoother sounding components. Also, Jan will know if his speakers really are as good as they can get. 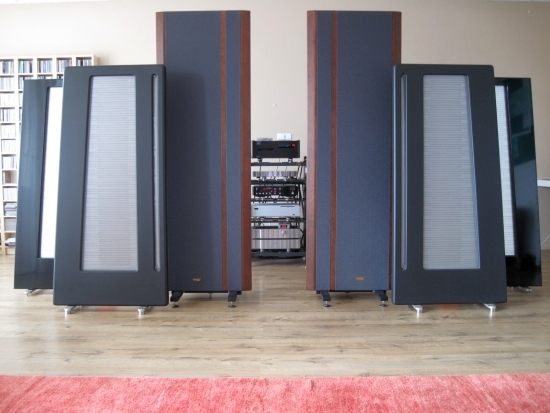 When we connected the newly built Duetta crossovers to the original Duettas we were shocked to hear how much the sound degraded! Sure, bass was fuller and the midrange was more forward and lively but the transparency and more so the coherence was greatly reduced, not to mention that the original set now also sounded screetchy and way too forward. Stop the clock – this meant that my initial assessment of the refurbished Duettas was flawed due to the “wrong” crossover. 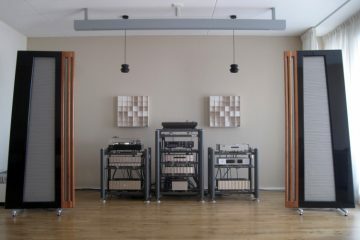 After some correspondence with the Duetta’s previous owner, it became clear that he had removed some components from the crossover, in an effort to make them sound purer, and in his setup at least, more transparent. But in the process it also made the MRTW much louder than it should be. I guess this was much of a system synergy thing because to my ears, the new crossovers actually sounded less transparent than the originals and although more forward and present, not more detailed and definitely less subtle. The extra perceived dynamics and more “live” feeling is very seductive, but ultimately I prefer the more balanced sound of original Duetta Sigs, or the Divas. There’s no doubt that for most sets the foam will have deteriorated after some 20 years. I’ve inspected Jan’s set and could indeed scrape it off with my finger: it was soft and sticky instead of firm and springy. Also, I could see that the foam that is sandwiched between the clamps on both side of the foil seemed to be in the same state. Yet, in spite of this, these speakers did not buzz unless played at ear-splitting levels, and even then, the buzz was only audible when standing right next to the speakers. When Apogees do start to buzz severely, or even rattle, I’m not convinced that this is due to the foam itself, rather due to the foil losing tension. The thing is: you can’t replace the foam without damaging the foils and you can’t replace the foils unless you are very, very handy. The foil is sandwiched between clamps not only by means of foam but also with silicone sealant and when trying to pry the clamps apart, you will inevitably damage the foil. 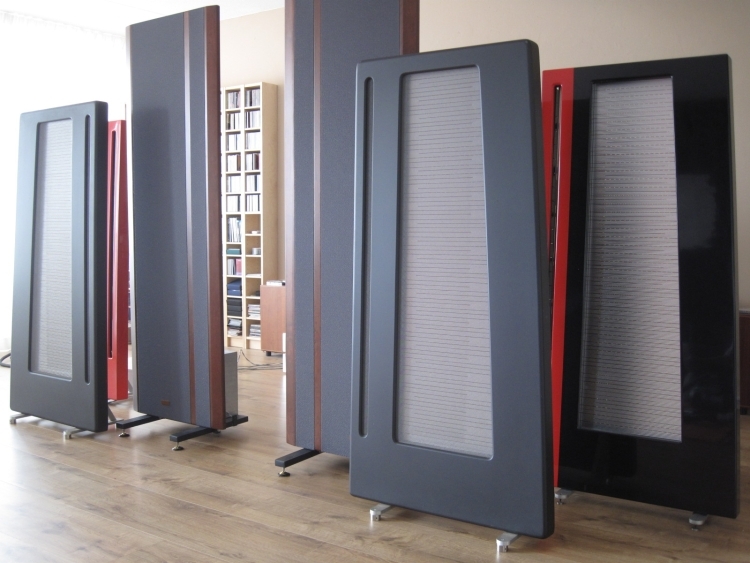 There are replacement foils from Graz, and also from another supplier in Germany but the former can only be installed by a certified dealer and while the latter can be installed by anyone, this is quite a challenging chore. Bottom line: listen carefully when buying. If you hear no buzz, chances are that that stays that way for many, many years to come – they might even live longer than your spouse will allow you to have them. 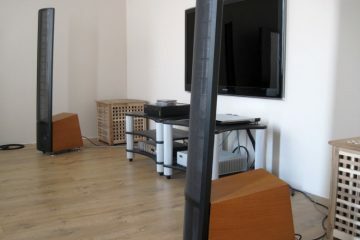 Also, these speakers cost so little secondhand that I feel they are quite simply worth the risk. 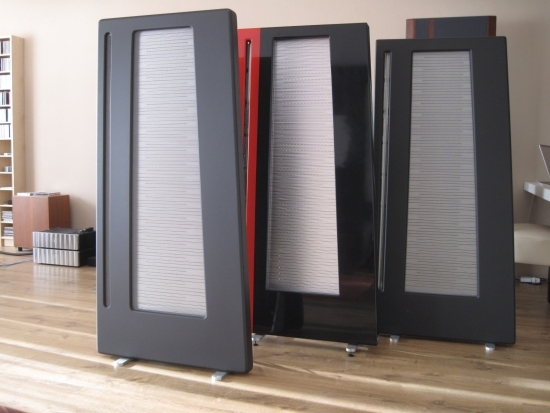 To me, they sound better than any other speaker in any practical price range and while Divas are indeed better, they are also very, very picky and don’t sound any good unless you really pull all the strings. Long after this review was finished, I conducted experiments replacing the non-standard crossovers with original ones. Read all about this on page 3.